But this is actually an extremely conservative estimate. 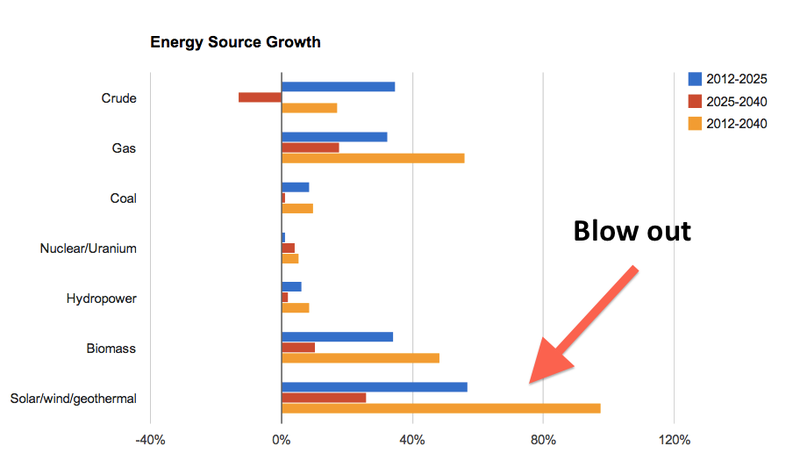 Renewables — and especially solar — aren’t really like other energy sources. Non-renewables are energy-rich fuels, but there is only a finite supply in the ground. This means that prices are unpredictable and subject to large spikes that badly damage the economy, as occurred in the 1970s and the 2000s. 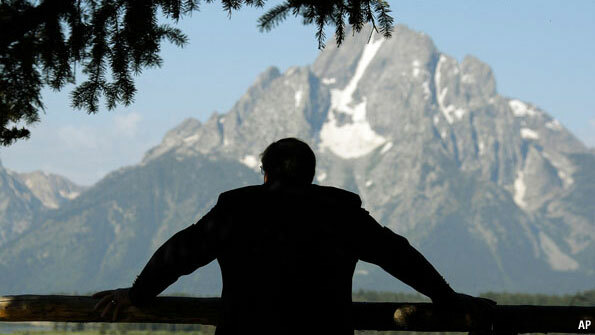 Is Global Warming a Blessing in Disguise? There can be no doubt that in recent years that there has been a large uptick in temperature, probably related to the sharp uptick in carbon dioxide levels. 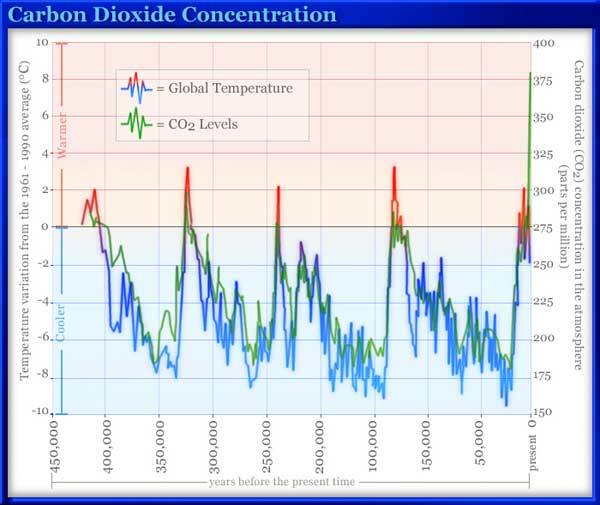 Temperatures have returned to levels last seen during the peak of the most recent interglacial period, 6,000 to 8,000 years ago Analysis by climate scientists has tended to focus on the disruptive effects that this may have — sea level rise, glacier loss, drought, etc. 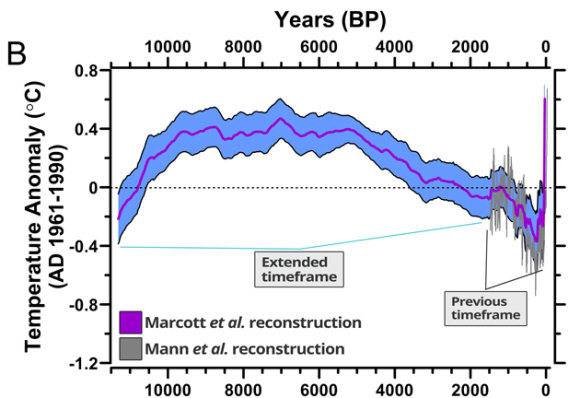 What’s striking about the extended timeframe data, however, is the gradual downward slope over the last 6000 years — the Earth’s climate was changing in the opposite direction when humans began offsetting this by burning fossil fuels. It does not seem unreasonable, given the evidence of a longer-term glaciation cycle, that had humans not started to emit massive quantities of greenhouse gases, that the cooling trend would have continued. Burning fossil fuels seems to have had a powerful countercylical effect. Falling temperatures and increased glaciation may have made it very difficult for human civilisation to continue to progress. The fossil record suggests humanity has existed in various forms for four million years, and there is evidence that non-anthropogenic climate change — including glaciation — has been a disruptive force in the past. So it seems increasingly likely to me that the countercylical climactic effects of the industrial revolution may have been supportive to the continued existence of human civilisation. Furthermore, had the anthropogenic emissions occurred at a different time — say, during a time of cyclical warming — the probability of catastrophic effects may have been much higher, because the effects would have been cumulative. That doesn’t mean that the current trend may not have catastrophic effects in the long run, especially if emissions and greenhouse gas levels continue to grow. I look forward to decreasing reliance on fossil fuels, and decreased carbon emissions. As solar power and nuclear power (etc) become cheaper and more efficient (inevitably eclipsing fossil fuels, whose extractable quantities are naturally limited) carbon emissions should gradually decrease. Given that we have already experienced significant countercylical warming, that is probably a good thing. Indeed, we may have gone too far already, and removing carbon dioxide from the atmosphere (perhaps even to pre-industrial levels) may be necessary. But given the pre-existing trend of falling temperatures, we must take seriously the possibility that anthropogenic global warming has averted big problems.